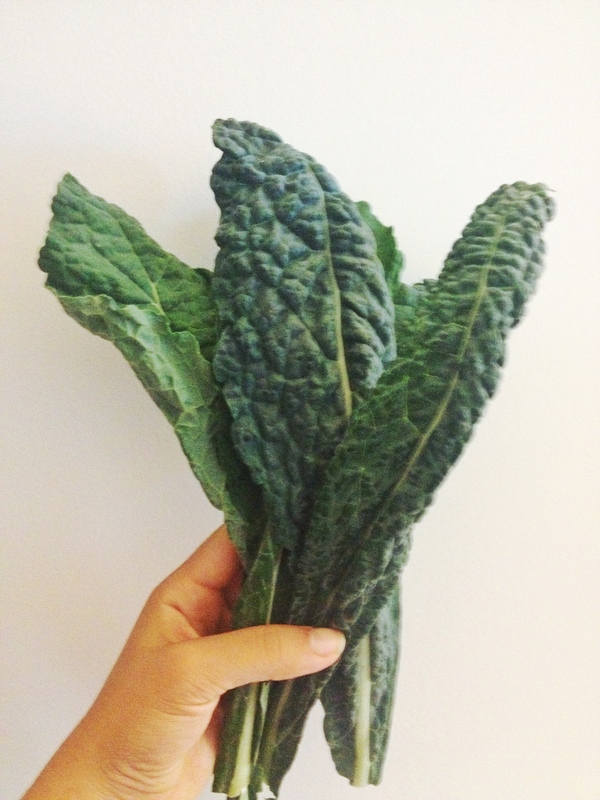 Use Lacitano (black) kale (see pic below). These leaves are slightly softer than curly kale and less bitter making them better for raw consumption. Remove tough ribs from each leaf. This part is hard for our teeth to break down, so cut out half the work by removing them. Just trace around the thick part of the rib with a sharp knife. Chiffonade the leaves. This is a French technique of cutting greens into thin ribbons. Start by laying leaves (less ribs) on top of each other. Roll as tightly as possible lengthwise. 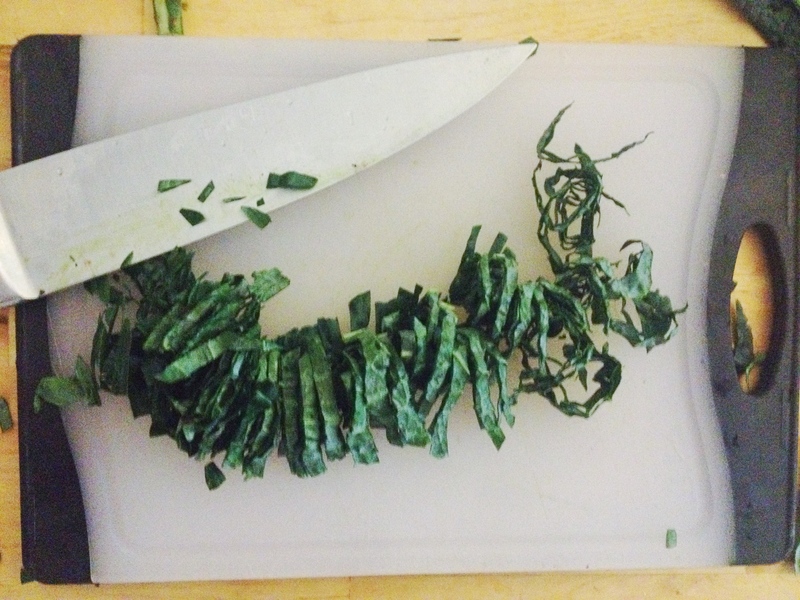 Using a sharp knife, cut along roll into thin ribbons. By doing this, you’re creating more surface area for dressing to stick on to, and allowing more air in for an overall fluffier salad. Use a creamy dressing, and a lot of it. Since kale tends to be a little bitter, the leaves can handle a hearty dressing. Dress the salad at least an hour before serving, to allow the leaves to soak up some of the liquid. Olives and sundried tomatoes are very popular ingredients in Mediterranean cuisine. They both have very intense flavours and should be used sparingly. Their natural oils being used in a roulade help keep the chicken moist while roasting in the oven. Keep reading for the recipe. We’d love to hear from you on how you incorporate Mediterranean flavours into your every day eating. Leave us a comment below! Prep the kale leaves. Remove ribs, chiffonade, and place in a large bowl. Add the ingredients for the dressing to a bowl and whisk until combined. This will take some effort. Dress the salad and massage with fingers. Set aside. Preheat oven to 350 Farenheit. Grease a baking pan with olive oil. Remove fillet from chicken breast. Place a sheet of cling wrap over chicken breast, and pound until flattened to about 1/4 inch thick. Spread tapenade / sundried tomato paste evenly on the underside of each chicken breast. Roll tightly so the mixture is on the inside. Dust the top of the chicken breast with salt and pepper. Place seam side down on the baking dish. Roast chicken for 20 minutes. Turn oven up to 425 Farenheit and roast for an additional 5 minutes until browned on top. Using a sharp knife, slice roulade evenly and place on plate with kale salad. Garnish with lemon and Parmesan cheese.